Join Rev. Michael Beckwith of Agape, Rev. 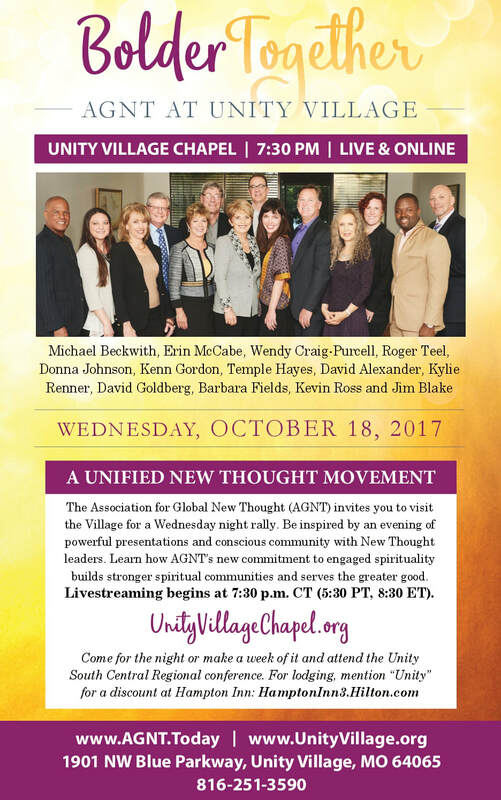 Erin McCabe of Unity Village Chapel, and New Thought's most prominent leaders for a powerful evening exploring spiritual practice and social transformation -- what The Association of Global New Thought calls engaged spirituality. * How to apply spiritual practices in your daily life in a meaningful way to effect real change. * How engaged spirituality can build stronger spiritual communities and serve the greater good. * First-hand perspectives by New Thought's most prominent leaders on social transformation. * How you and your spiritual community can participate directly in this exciting new work. For two decades, ministers from within Unity World Headquarters, Unity Worldwide Ministries, Centers for Spiritual Living, Science of Mind Magazine, Agape, and other positive changemakers have worked together under the banner of The Association for Global New Thought (AGNT), inspiring individuals and congregations worldwide to participate in a mission of spiritually motivated social activism. We are now taking the next (r)evolutionary leap and invite you to join this timely movement! Questions about this event? Jenny at the UVC office | phone (816) 251-3590 | email unityvillagechapel@gmail.com, Tue-Thurs 9am-4:30pm CT.
New Thought is a spiritually motivated way of life that embraces the ancient wisdom traditions of east and west. We embody the belief that consciousness is elementally creative and reciprocates thought, inspiring us to co-create with the Divine to shape the realities of our lives. In 2015, New Thought was recognized as a world religion at the Parliment of World Religions. What is AGNT (The Association for Global New Thought)? The Association for Global New Thought was co-founded in 1996 to represent the leading edge of the New Thought lineage. Its leadership, member churches and spiritual centers are part of Unity, Religious Science (now called Centers for Spiritual Living), and nondenominational New Thought communities. AGNT is committed to global healing achieved through personal transformation, community-building, interfaith, intercultural, and interdisciplinary understanding, and compassionate activism. A Unified New Thought Movement will embody and express the universal power of the sacred in service of a world that works through everyone. Will all 13 people on the Leadership Council of AGNT be at this event in person? Yes! This is very exciting and we encourage you to experience that energy in person by joining us at Unity Village or Livestream online. Free parking at Unity Village. Follow signs to the Activities Center.